Places we’ve been since our last update: Atlanta, Vancouver, Washington DC, Mexico and Night Vale. Many thanks to the folks we saw at Dragon Con, Kumori Con and Anime USA! It was our first time going to Dragon Con and WOW nothing could have prepared me (Dusty) for that experience. I’ve been doing cons for ten years, probably been to around 200 conventions. Dragon Con was INSANE. I wish I’d had more time and energy to party because YIKES is there partying. I also went to Anime USA in DC and managed to get in a day of sight seeing. I got up at 7 to go to the National Zoo (which is FREE and opens at 6 AM, my god) for a few hours, which was AWESOME cause I had the whole place practically to myself. And it was all warm and rainy. Then I took the subway to spend a little time at the American History Museum (a personal favorite.) Then had to run about half a mile from the metro to my hotel to catch my shuttle for my 5 PM flight. In all, I ended up walking around 8 miles, I think. This was a TERRIBLE idea, given my comic-book-and-web-site-making-obviously-active lifestyle. I could barely even walk for two days after I got home. I then immediately had to take a trip down to San Diego for an emergency visit to my dentist in Tijuana which turned out to be nothing. So that was fun. We’ve got some appearance announcements. First off, we’ve had to cancel a number of conventions for the end of the year. We won’t be able to go to Comikaze in Los Angeles because Dusty’s little brother is getting married that weekend so it’s sort of important. Sadly, we are not going to be able to make it to Bent Con this year. We might try to stop by the con for a day but we can’t afford to exhibit. So hope we see you there! If you haven’t checked out Bent Con yet, you MUST. It’s a gay comics convention in So. Cal and it’s wonderful! Double sadly, Daishocon has decided not to invite us back for 2013. It’s a bummer since we absolutely adore Daisho and have had so much fun being guests for the last three years. But three years is a long time to invite someone back again and again so we understand. We’ll really miss all of you wonderful people we’ve met through Daisho, and sad not to be doing So You Think You Can Cosplay, especially since our fashion show had been picking up steam. But we hope that you all have a fantastic time for us this year at the Kalahari and best of luck to all of you in the cosplay contest! In better and super AWESOME news, we are going to be going to Austin for this year’s Dragon’s Lair Webcomics Rampage! This is held in a CRAZY HUGE shop — we met the team this year at San Diego Comic Con and were so excited when they invited us out for this year’s event. Our wonderful friend and creator of Artifice and the Young Protectors is also going to be there and it is going to be a party! Hope you can come. We won’t be exhibiting at this year’s APE in San Fran, but we will be there and I (Dusty) will be on a panel about queer comic things with a whole bunch of awesome queer people. 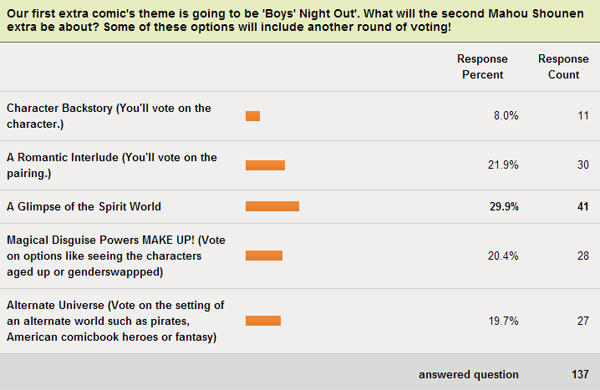 In Kickstarter news, we’ve got the second round of polls going right now! 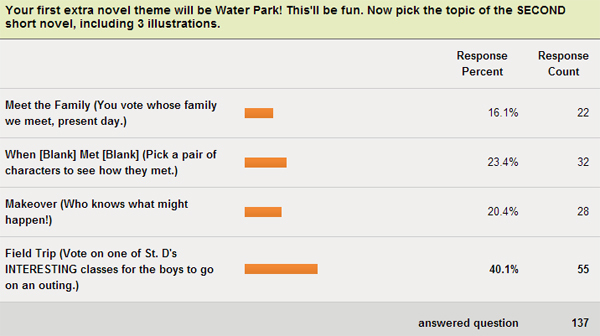 Backers are voting on what the extra content in the book will be. Here’s the results so far — if you’re a backer and you haven’t voted, be sure to log on to Kickstarter and check your messages! In personal news, we had a pretty awesome and fun week this week. We’ve been so social and getting out of the house and everything this week! On wednesday, we had the thrill of going to a Welcome to Night Vale live show which was just THE BEST. We got to listen to an episode that isn’t going to be released on the web, at least for a while, and wow what an awesome and emotional and poignant episode it was. I made these and printed out a few for the Night Vale crew and I was super flattered that they liked them 😀 JD gave Cecil and Josef narwhal finger puppets which evidently devolved into swordfighting. And now we’ve got one of these with a collection of autographs and all in all stuff is freaking awesome. Then last night, a wonderful friend took us to a show by the San Francisco Neo-Futurists where we got pummeled with tortillas, splashed with paint and laughed our asses off (peppered with some intense and beautiful and personal monologues by the cast.) This was the final show of Too Much Light Makes the Baby Go Blind but they’re going to be starting up again later this fall and if you’re in the Bay Area, you MUST check this out at the Box Car theater. P.S. – If you’re into Night Vale, pretty much all of our warm up and fun time art has been WTNV lately >_> It ends up on our Tumblr. Wow this was a really long blog post. See you, sparkle cowboy. 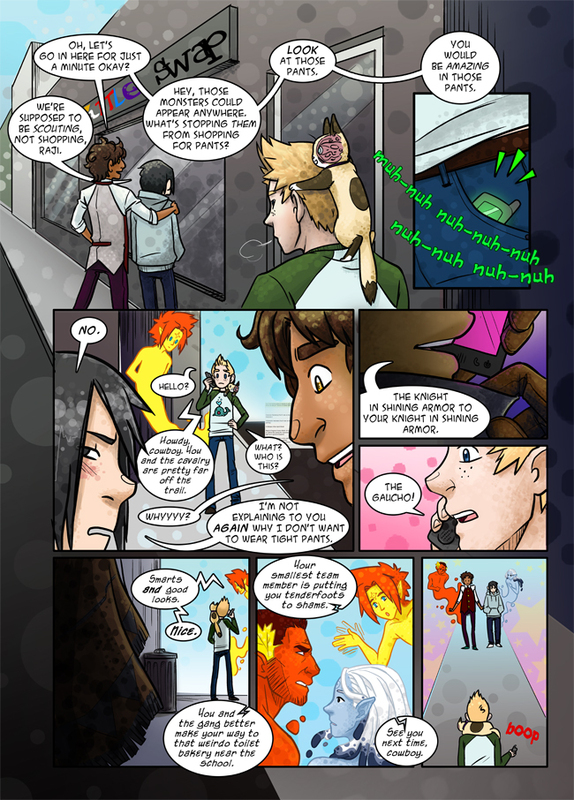 Yay, new page!!!!! It looks great! I love the conversation between Raji and Yuki. I’m sure the bad guys could have been pants shopping after they hit the bakery, Raji. I bet Alex would like to see Yuki in those tight pants too, lol. Btw, that was a total Cowboy Bebop reference there at the end, wasn’t it? I squeaked in happiness! Hmm, but how did Gaucho get Mike’s cell number? This comic is a delight to read! In the first panel it looks like teacup is trying to steer Mike.